Our natural tin nativity sets in small and medium sizes are a perfect way to keep the true spirit of Christmas alive in your home this Navidad season. 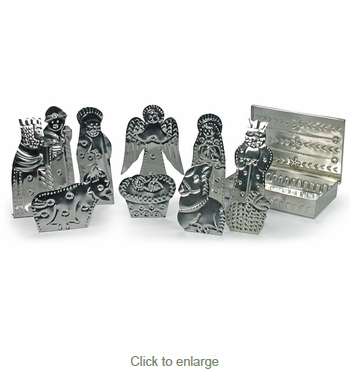 These tin nativity sets are all individually handmade by Mexican artisans and come with a decorative tin keepsake box. This ten piece nativity scene also makes a perfect Christmas gift for friends and family. As with all of our hand crafted folk art items, expect some variation in size and color with these individually created nativity sets.